My new Néojaponisme piece about the history of haikara is up. [H]aikara was just one of many similar Ishikawa-isms. His work lampooned not only the Haikara Party (ハイカラア党) and their allies the Necktie Party (ネクタイ党) but also their conservative enemies: the Pistol Party (ピストル党) and the Chonmage Party (チヨム髷党). None of these other words, Ishikawa admitted in a later memoir, caught on. So why did haikara? "The picture in this postcard was taken in the Showa 30's (1955-1964), I think. The tower you see is called an 'SP Tower'; it's part of the sulfite pulp plant. When I joined the company in Showa 45 (1970), they had already scrapped this plant. The smokestack was left as it was, but I think it's been demolished by now. At the time there wasn't really a concept of 'pollution' in Japan, and it really smelled terrible when you were passing Fuji Station in a train. It seems unlikely that [Honshu Paper] was making picture postcards back then, so this is probably made by Fuji City as an advertisement. Fuji was a paper manufacturing town, with over 200 mills (large and small), as I recall. The largest of all was the Honshu Paper Fuji Factory, and I believe it's still the biggest. I bet whoever made this postcard would never have dreamed that it would end up put on a blog and discussed like this. Way to dig this one up!" I hereby award one point to Adamu. I'll just come right out and admit that I don't really understand this postcard. 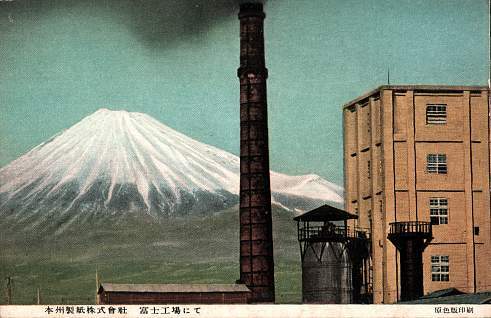 The text at the bottom left says "Honshū Paper K.K., Fuji Factory." Honshū Paper was, it seems, a corporate precursor of today's Oji Paper Group, and "Fuji" is obviously Mount Fuji. This is all clear. What I do not understand is why any manager would okay this as a postcard. Maybe it dates from the days when Japanese manufacturing was still new and exciting. Maybe it was produced as a promotional item by Honshū Paper themselves. Either way, what is with the smoke? Surely even the most patriotic and/or company-loving Spirit-of-'67 industrialist would had second thoughts about advertising their project's ability to pollute and spoil beloved natural symbols. The composition here is great, though. The chimney extends from below Mt Fuji's roots to above its heights, dividing the scene neatly in two. On the right, the edge of a factory looms into frame, fringed by metal shoots like steampunk bamboo; on the left, the ancient mountain broods behind ominous exhaust clouds. The two worlds remain nominally divided, but unlovely modernity is seeping into the world of symbol and spirit. 2009-01-27: Update from a primary source! "Chokotto marin" ga ichiban kawaii! "Kinda marine" is cute to the max! That is to say, a woman whose outfit draws subtle inspiration from those who ply the open sea (or maybe just the bits around Shōnan) will be more fashionable than one whose outfit does not. Reading How did the guitar change Japanese song? (ギターは日本の歌をどう変えたか) by KITANAKA Masakazu (北中正和) today, I came across an interesting claim regarding the etymology of sabi. Wabi-sabi, possibly via sabigoe, "sabi voice", a term in traditional Japanese music. Wasabi, because the sabi in a song functions like wasabi in a piece of sushi, intermediating between and dramatizing the other ingredients. Kitanaka offers an alternate explanation which he attributes to HAYATSU Toshihiko (早津敏彦)—it seems to be in Hayatsu's History of Hawaiian Music and Dance in Japan: Aloha! Mele Hawai'i (日本ハワイ音楽・舞踊史—アロハ!メレ・ハワイ). According to Hayatsu→Kitanaka, the word sabi was invented inadvertently by Hawaiian music demigod Ernest KAAI, who made a big impression when he came to Japan in the 1920s. The story goes like this: Back when AABA was still the most common popular music form, the B part would often be in the subdominant. Ernest would therefore write "SAB/" (for "subdominant") on the B section in sheet music, to give the players a broad heads-up. Japanese musicians thought the slash was a capital I, and read it as sabi. A word is born. I have grave doubts about this etymology, starting with the idea that Kaai didn't know how to spell "sub". But I still think it's more likely than the "wasabi" explanation. The opening is fairly standard Kabuki self-introduction patter, with the vendor declaring his origins ("... twenty ri capitalwards from Edo, in Odawara, Sagami province...") in a long, rambling sentence that finally ends in his name: Ensai. Ensai gives his audience a quick review of uirō history (magical medicine invented by China and approved by Japan's emperor), and then moves on to his main claim: that uirō will, by improving the health of your Q-zone, grant you near-magical eloquence. The a-wa-ya [i.e. mora starting with /w/, /r/, and with no initial consonant] in the throat, sa-ta-ra-na on the tongue, the ka off the canines and sa off the teeth, ha-ma both on the lips, one light and one heavy, all opening and closing smoothly, a-ka-sa-ta-na-ha-ma-ya-ra-wa, o-ko-so-to-no-ho-mo-yo-ro-o, hitotsu hegi-hegi ni... [from here on out is just a tongue-twister combination of words for sound]. A-ka-sa-ta-na-ha-ma-ya-ra-wa and the /o/ version are the Japanese consonants, in traditional order, with the first and last vowels (/a/ and /o/) respectively. Note that the /wo/ is just o — by Edo times the /w/ had already been lost. I should note, too, that despite my English Wikipedia link above, this sales pitch is really for the medicinal product named uirō, which the original manufacturers in Odawara (who claim descent from a Chinese official who fled Zhejiang when the Ming Dynasty crushed the Yuan [Mongol] Dynasty in the 14th century) lay jealous claim to, rather than the delicious sweet named uirō, which is made all over the country—I understand that Nagoya's is actually more celebrated than Odawara's. For the sake of fairness, let it be recorded that the Odawara medicinal uirō clan believe that all sweet uirō nationwide are derived from their ancestor's non-medicinal recipe, and as evidence they offer the fact that there is no normal way to get the reading "uirō" from the kanji 外郎—it was some weird decision made by their founding father when he arrived in Japan. 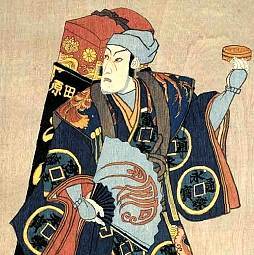 They also claim that Uirō-uri , the play, was either commissioned or written by kabuki actor Ichikawa Danjūrō II (二代目市川団十朗) as a token of his appreciation for this marvelous medicine which had, they report, restored his voice when nothing else could. Happy New Year! To kick 2009 off right, I invite you to enjoy this marvelous performance of "Marching March" by UA. "Marching March" was composed in the '60s by HATTORI Kōichi (服部公一). The lyrics, written by SAKATA Hirō (阪田寛夫), open with the narrator ordering his legs to carry him to a field, via various kinds of roads and making agreeable sounds such as zakku zakku and bokko bokko, so that he can search frogs and earthworms for navels and eyes respectively. Anyhow, the 1965 performance of "Marching March" by AMACHI Fusako (天地総子) and the Otowa Yurikago Kai (音羽ゆりかご会) picked up a Japan Record Award in 1965, and looked something like this. Today, your standard uta no onē-san/onii-san rendition looks like this... so as much as I like Amachi's groove, UA's slower, country-brass-banded performance is a kind of revelation.